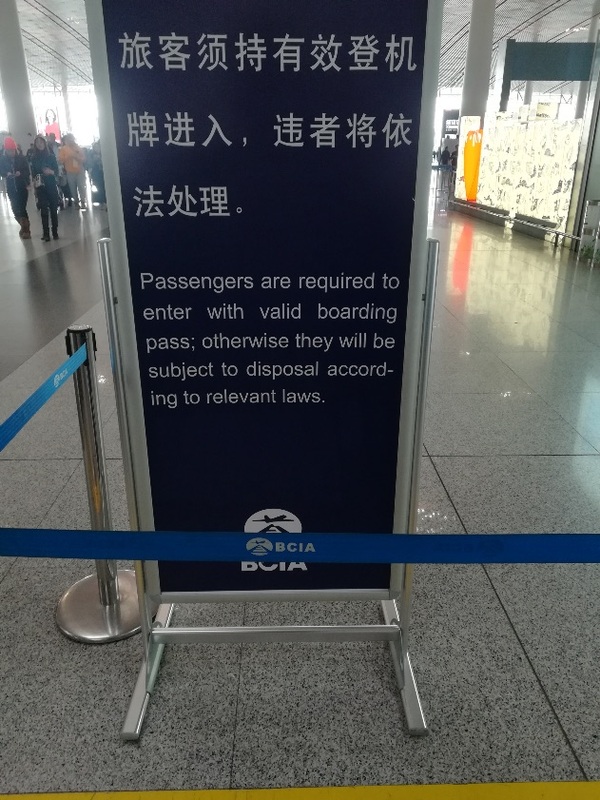 Passengers must enter with a valid boarding pass; offenders will be dealt with according to law. The second item is more or less understandable without extensive explication, so I'll leave it untranscribed and untranslated, leaving it up to Language Log readers to savor for themselves, except for #2, where "dí 嘀" ("beep") is the sound you'll hear when the green light goes on. The card is a room key from Qinyuanfu Hotel in the grounds of the Chinese Academy of Agricultural Sciences, Beijing. The last line is a beautiful illustration of how context lets languages get by without a passive. 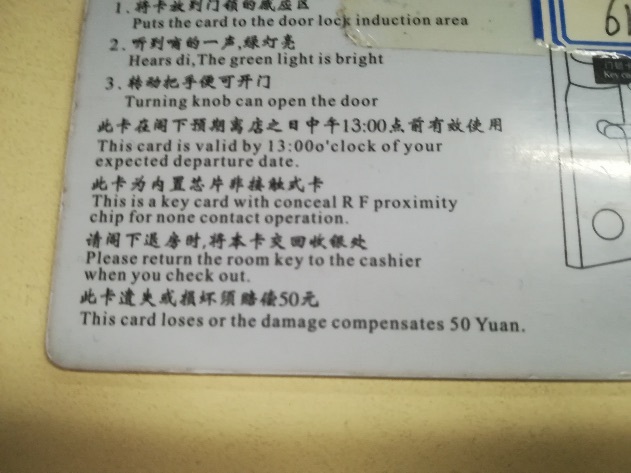 I guess the last line of the hotel keycard actually means "If you lose or damage this card we will charge you 50 Yuan"? And "valid by 13:00" should probably be "valid until 13:00" (or "1 pm" if you expect the customer to be unfamiliar with 24 hour time). Other than that it is indeed quite comprehensible. I probably would have guessed "di" for onomatopoeia even without help, especially when it actually happened at the same time as the green light lighting up. The one about returning the key is actually good enough to have been written by a native. I don't know whether that is *actually* rare or if people are just picking the bad/funny translations so that it *seems* rare to see one go completely right. @ Chris – My guess would be something like google translate, where boilerplate phrases can often be correct (thanks to human input via that "suggest a better translation" function) while other sentences are subject to the usual machine-translation errors. As to the frequency of such bad translations, I see such things every day and I live in a European country where around a third of the population speak at least some English (a typical example I noticed recently being a fairly upscale, trendy restaurant in the cosmopolitan city centre boldly advertising "freshly pastes" instead of fresh pasta). There's not the same preponderance of shredded fucks and so on, but bad and funny translations are ubiquitous.